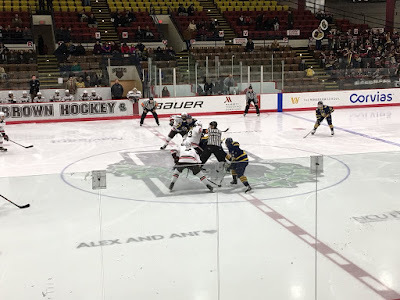 The Quinnipiac Bobcats got back into the win column and earned two important ECAC points with a 3-0 win over the Brown Bears on Saturday night at Meehan Auditorium in Providence, Rhode Island. 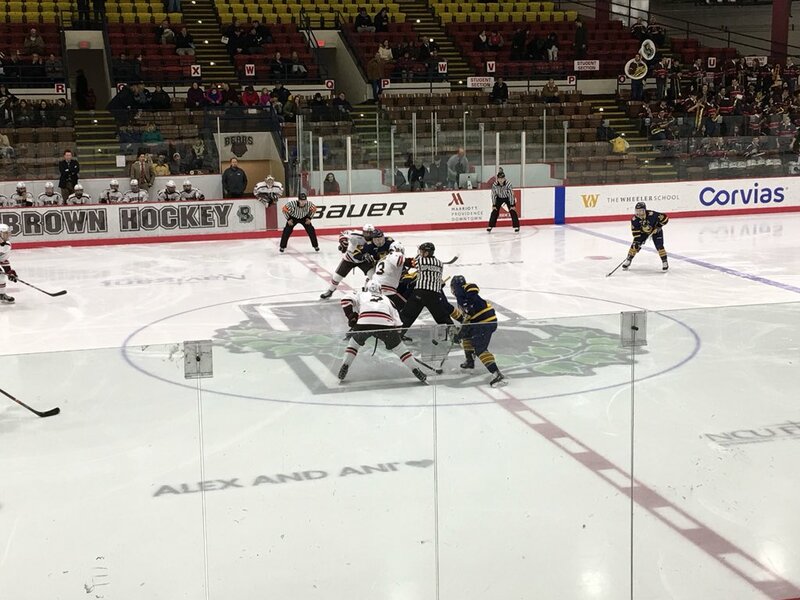 A night after suffering its first loss to Yale since 2013 with a 3-2 loss at Ingalls, Quinnipiac was in need of a split of the weekend road trip and playing perennial ECAC bottom feeder Brown helped the Bobcats fortunes. It was Quinnipiac's second shutout of Brown this season as the Bobcats won 5-0 over the Bears back on October 17th. Three different Bobcats scored on the night including Hamden native Joe O'Connor's first career collegiate goal and point when scored on his knee sliding into the slot. O'Connor is the first Hamden native to score a goal in a game at the Division I level and first to do it for Quinnipiac since Justin Nolan in the 1997-1998 season. Andrew Shortridge (22 saves) posted his 5th shutout of the season and 6th of his career. "I thought we were pretty good, said head coach Rand Pecknold. The first period was a little shaky at times and we didn't play hard enough. We found a way and O'Connor gets nice goal and Shortridge was excellent. He was our best player tonight which is what you need from your goaltender." After the sluggish first period Quinnipiac took control just 55 seconds into the period when junior defenseman Brandon Fortunato scored on a breakaway. After a slow start to the season, the transfer from Boston University has been hot in the last four games played with 4 points (3 goals, 1 assist) after only having two assists in the first 25 games of the season. "We regrouped and we had a really good second and third period, said Pecknold. It's a good road win." The Bobcats final goal was thing of beauty. Karlis Cukste's outlet pass from the edge of the defensive circle found Kevin Duane alone for a breakaway which he buried glove side past Brown's Luke Kania. 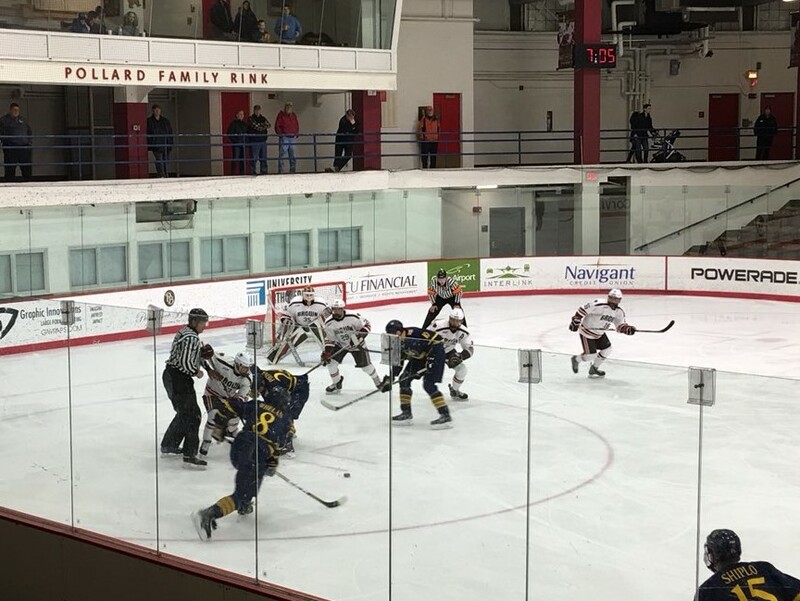 Three players that don't normally score goals helped propel Quinnipiac to this win. "We need goals, said Pecknold. Where they come from it doesn't matter." Quinnipiac played strong defense in the third period and did a good job when the Bears pulled their goaltender with 8 minutes left in the game. It also helped having a strong performance in net from Shortridge who recorded his 3rd straight win and 5th in the last seven games that he played in. "We needed these two points, said Shortridge. This game was huge. We're definitely taking this win to build momentum into the rest of the regular season and into the playoffs." As Quinnipiac heads into the final two weekends of the regular season they currently sit in 9th place in the ECAC standings with 16 points but trail 5th place Colgate by only two points. These next two weeks will see a lot of jockeying for position in the middle of the ECAC. The Bobcats return home next weekend to face second place Union on Friday followed by 11th place RPI on Saturday which will be senior night.